In order to afford a modest, two-bedroom apartment in Illinois, renters need to earn $20.87 per hour. This is Illinois’ 2017 Housing Wage, revealed in a national report released today. The report, Out of Reach 2017, was jointly released in Illinois by Chicago-based Housing Action Illinois and the DC-based National Low Income Housing Coalition. To afford a one-bedroom home, a worker earning Illinois’ minimum wage ($8.25 per hour) must hold down more than two full-time jobs and work 85 hours per week. To afford a modest two-bedroom unit, a family with two minimum wage earners must work the equivalent of 2.5 full-time jobs, or 101 hours per week, between them. Despite the cost of rental housing being out of reach for low-income households, President Trump’s federal budget proposal for next year includes deep cuts to rental assistance and programs that create affordable housing. Overall, the proposed budget allocates just $40.7 billion for HUD programs in Fiscal Year 2018—$7.4 billion (15 percent) below what was recently approved for Fiscal Year 2017. Just in Illinois, the Center on Budget and Policy Priorities estimates that President Trump’s budget proposal would cut 10,734 housing vouchers, slash more than $107 million from our state’s public housing funding, and eliminate approximately $149 million in Community Development Block Grant (CDBG) funds and $40.5 million in HOME funds. Nationally, the proposal would also cut $133 million from homeless assistance grants and eliminate the National Housing Trust Fund. According to Out of Reach 2017, the average cost of rent and utilities for a two-bedroom apartment in Illinois is $1,085 per month. In order to afford this without paying more than 30% of income on housing, a household must earn at least $43,406 annually. Assuming a 40-hour workweek, 52 weeks per year, this level of income translates into a Housing Wage of $20.87. The cost of rental housing varies across the state, but there is no place in Illinois where a minimum wage worker can afford a two-bedroom apartment. Rental housing is the most expensive in the Chicago metropolitan area, where the Housing Wage is $23.69. In rural areas of Illinois, the average two-bedroom Housing Wage is $12.58. Illinois isn’t alone in having a painfully high Housing Wage. 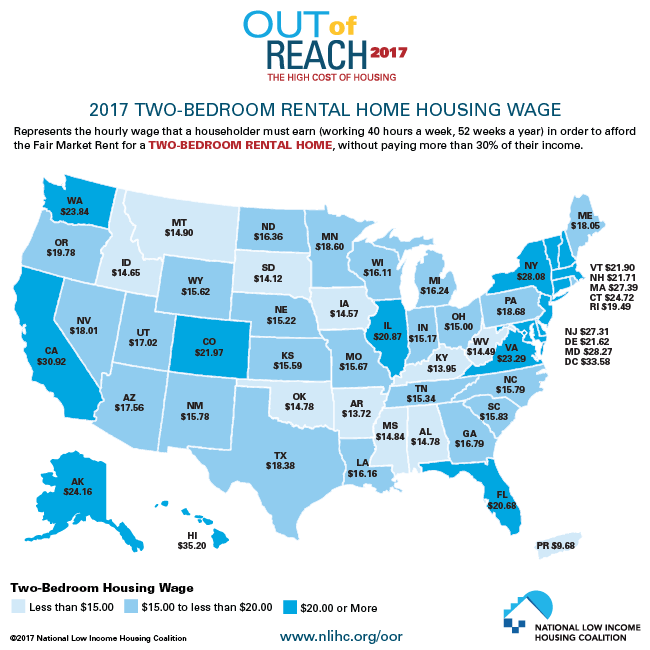 Out of Reach finds that in no state, even those where the minimum wage has been set above the federal standard, can a minimum wage renter working a 40-hour work week afford a one-bedroom rental unit at the average Fair Market Rent. Out of Reach provides the Housing Wage and other housing affordability data for every state, metropolitan area, combined non-metropolitan area, and county in the country.